For Father’s Day this year my wife gifted me a “Day of Lard”. We rented the clubhouse in our community and several friends and myself played some Too Fat Lardies games, ate great chow and drank great beer. We then headed to our house for dinner and some late evening What a Tanker. Overall I think is was a huge success, and there are other smaller regional “Lard Days” being planned. Hopefully others felt the same and we’ll do it again next year. Here are a few pictures of the “Hell’s Highway” CoC game and Ed B’s excellent AWI Sharp Practice game. Next time we’ll document it better. 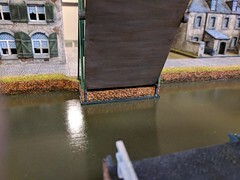 We finally had a short break in the weather, so I was able to fire up the airbrush and finish the Opel Blitz and the sea wall. The truck is from Rubicon and built straight from the box. I created the sea wall by 3D printing the stone cap pieces which I then affixed to lengths of 90 degree angled styrene. I then created the wall by cutting sections of G-scale corrugated sheet and gluing them to the angled pieces. The backside of the plastic sheeting had the shape I wanted for the wall corrugations. 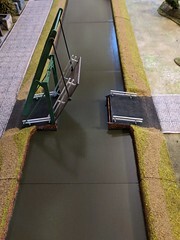 The dock cleats are an O-scale model railroading product. I may circle back and airbrush the stonework a bit more if I have enough time. Up next I’ll start working on the U Boat. Happy New Year everyone. I was able to work a little over the holidays to add some details to the board. I’m sure it’s somewhat hypothetical, but I wanted a cart with some torpedoes on it. I took a chance and bought a Sarissa Bomb Trailer Set in the hopes that I could modify it to fit some 1/48th scale resin torpedoes I found. Thankfully it worked out pretty well. I only had to shift the cradle pieces up a bit to accommodate the length of the torpedoes. The “fish” are probably meant to be for aircraft, but they work for me. To add some more weapon supplies to the dock I ginned up these mines. Again not very historically accurate, but that’s okay by me. I took some bits and whatnot from around the house and painted them up. I have an Opel Blitz that I’m going to put these in, but it has been so cold here that I am unable to airbrush in the garage. Up next I’ll start working on the sea wall and some electrical poles.